This lattice work sampler – where I’m using a bunch of different lattice stitch fillings and other techniques from the Stitch Fun series – is turning into seriously random embroidery chaos. Don’t we all have Those Days now and then? On Those Days, I know I should be doing something stitch-related, but I have to clear my head first. And so, I pick up this little sampler and put a half hour or so into it. What do you think magically happens? My head clears, and I find myself formulating a clear plan. And while there’s absolutely No Plan to this sampler, it’s perfect to work on while Making Plans. In the photos above, do you recognize the filling technique? It’s battlement couching, and while it’s similar to the area worked previously and filled with the same technique, this time the colors are opposite in filling order. The red sits on top here, with the darker yellows in the background. What do you think? Do you like this version of battlement couching better, or this version? Blue! This section cried out for a blue outline. Being somewhat tired of chain stitch, which (in one way or another) has made up the majority of the outlines on the sampler, I opted for raised stem stitch, one of the stitch tutorials covered in the Stitch Fun series. I worked the raised stem stitch in alternating lines of dark and light blue. Golly, it was so much fun, that before I knew it, I was setting up another foundation for raised stem stitch on this circle element. Raised stem stitch makes a neat, clean filling, and it works up fast. Just remember to use a tapestry needle once you start the stem stitch part, and before you know it (and I mean lickity-split! ), the area you’re filling will be full. It’s fast! It’s fantastic! It’s fun! I went for the reddish-orange and yellow combination on this one. The sampler’s filling up. There are only a couple more significant spots left to go. And then what will I do for brain juice? In any case, there’s a moral to this story: Never underestimate the power of random embroidery for clearing the head and revving up the brain! It works! If you like playing around with embroidery stitches and want to go all random with some Stitch Fun, feel free to visit the Stitch Fun index, where you’ll find tutorials for all the stitches used in this particular jumble, as well as the somewhat bizarre embroidery pattern used for this sampler. Oh, I so agree, Mary. This kind of nose-following relaxed experimentation with colours and stitches – playing with the materials with no worries about design or art, and with no set purpose in mind – is such a good way to get new ideas going and plans hatched. And you learn useful things from doing it, too – and all painlessly. This Jumble is getting very pretty. That’s the other plus: sometimes the random experiments do become nice finished things in themselves. But if not, no worries! For the battlement couching I love this version the best. The color seems to pop. And I love the brightness that blue adds. May I ask you how big did you enlarge your pattern? I enlarged mine as much as I could to fit an 8 x 11 sheet of printer paper but the width of some of the shapes do not seem big enough to allow the fillings to look their best. I’m thinking of enlarging again and starting over before too much time is invested. And if you are really asking for a suggestion for more brain juice after this project, I’d like to suggest another random sampler as I am totally empathetic to how this project is so relaxing to work on. This sampler makes me happy! 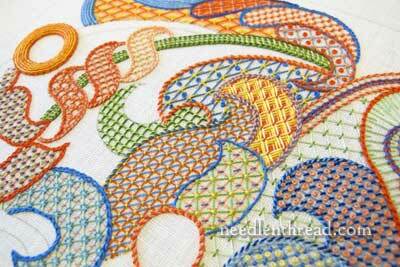 There’s just something about the combination of shapes, colors and stitches that is energizing and inspiring. I love your random embroidery chaos, I love the different shapes and different techniques of the Lattice stitch that you are using on your sampler and I really like the vibrant colours you have chosen, what a lovely way to sit, think and clear your head to make embroidery plans. Wonderful!. I’m really liking the looks of your sampler. And, yes, I like the darker red-orange on the top better than the yellows. You have such a wonderful color sence. The overall image is so very visally exciting. Continue fueling your brain juice! I have a question in the raised stem stitch. If one wanted to do that stitch on a silk and goldwork project, would it be better to use a heavier thread such as a silk twist? It looks like it would add variety in dimension and texture. Hi, Carrie – yes, it would look great in silk, with a heavier twist. 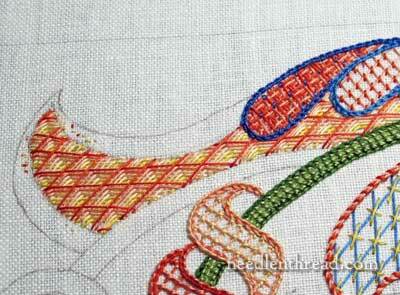 Just make sure to check the twist – if it’s a z twist, you’d work the stitch like the outline stitch…. Checking back to the first battlement couching, I found it a bit insipid compared to this one. It seems very back to front as far as colour theory goes, but this one is more appealing. Learn the rules and then break them for surprisingly satisfying results. Rules? Well, perhaps grounding principles! Raised stem stitch is lovely. I like your stitching the alternate colours. The sampler is very agreeable. Umm…I mean it’s really great! Have just been watching the very sedate BBC version of Jane Austen’s Mansfield Park. Everything is ‘agreeable’ or ‘disagreeable’. I prefer Time Life’s livelier version but is something intriguing and sort of comical about the sedate Fanny’s ways of showing her fervent approval and earnest disapproval. WOW Mary! Looking good!! Your colorful project reminds me of the Russian onion domes. Was that a conscious decision or something that just happened along the way? So inspiring, this sampler. I’d like to start something similar for exactly ‘those days’ when I just want to sit and sew mindlessly. I prefer this version of the battlement couching, it looks striking. It’s like doodling with needle and thread — how clever! I love looking at all the pretty little details. Wow Mary the colors and the stitch choice really make the circle pop! One of the things I’ve learned while pursuing my BFA is that working on a different piece or several at once allows your subconcious to deal w the problem area. Several of my instructors have us use this method (before they’ll help!). Can’t remember where, but a researcher w MRI scanning showed how more neural networks are built in the brain- – instead of doing the same thing over and over (one way circuit). Pity I can remember these kinds of details; until it’s TEST time in school! 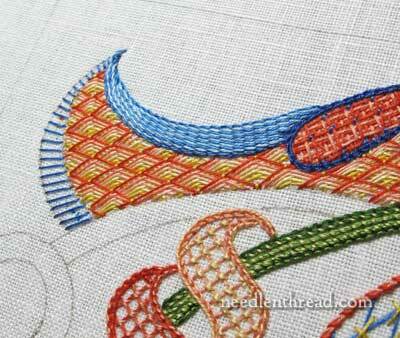 I absolutely love this filling with the blue raised stem stitch border. It reminds me of traditional Japanese paintings and kimono prints, especially the way fish were usually depicted. This reminds me of a beautiful carp in a clear blue pond. You have definitely got my creative gears turning today Mary! Thank-you! I love to look at your stitchings they are done so neatly and beautiful, I downloaded the pdf so hopefully one day I can try to conquer this. Thank you and I love your blog. I agree with Jacqueline that I LOVE this version of Battlement stitch BUT the other version would be useful. I don’t know why, but it reminds me of a hobbit door. I’m sure it would be perfect for something secret. I think both versions of the Battlement couching are great, each has it’s own look, a great way to use the same stitch without looking repetitive. It’s amazing what happens when you reverse the order of the colors. I like the darker threads on top, today’s version, a little better. All of your explorations are beautiful, and playful. You’ll have to start a new one. This turned out totally awesome! I need to try something like this 🙂 I am afraid I don’t know enough stitches to combine them nicely. 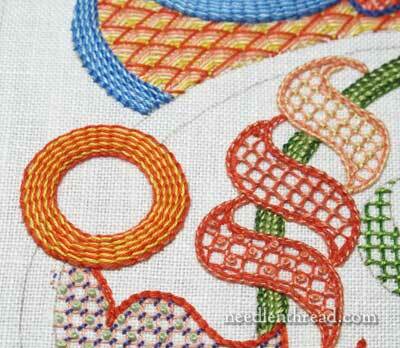 Was wondering what you’d do with the circles but the raised stem stitch is the best idea! 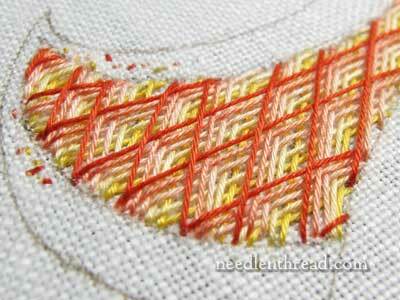 I love the play of colours in this random embroidery lattice sampler! je suis passionnée de broderie et je m’intéresse beaucoup a votre site merci pour toutes vos explications. Mary, although i have been reading your blog for some time, I haven’t commented. When i find bloggers that routinely receive a lot of comments, I doubt mine would ever be missed. But it is high time I thank you for all the amazing instruction and inspiration you share here in this space. And especially for this incredible lattice sampler. I am determined to try every single option you have shared. And I love that you are treating this as that – a sampler that simply provides you a journey with no clear destination – only the next exploration! So. Belated but nonetheless heartfelt, thank you. I love this piece. It has a Bohemian flair that I fine quite appealing. 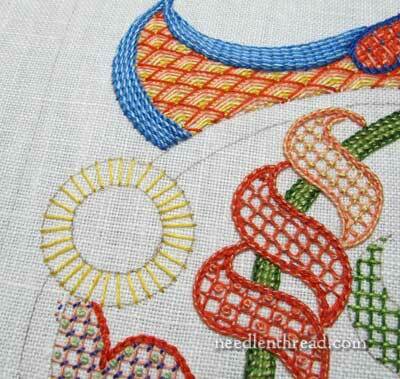 Previous Previous post: Carrickmacross Lace Sampler & Curved Scissors – Winner Announced!